Maggy has been without a job in London for two years. Her neighbor sets her up as a secretary to Mr. Wight, an alcoholic private investigator. When he sends her home minutes after her arrival on her first day, Maggy cleverly solves one of his cases and pockets the fee. When her boss is assaulted and hospitalized, Maggy is left to her own devices. 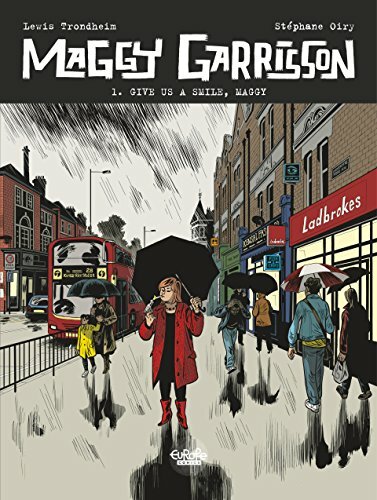 Maggy Garrisson is a great British detective noir. Maggy is a flawed female lead, which is a nice change from Chandler and Hammett’s sexism. Maggy is also going down some mean streets with thugs and thieves aplenty. This comic is highly recommended for fans of hard-boiled private detective fiction. Even the art is dark in the world of Maggy Garrisson. 4 stars! Thanks to the publisher, Europe Comics, and NetGalley for a copy.